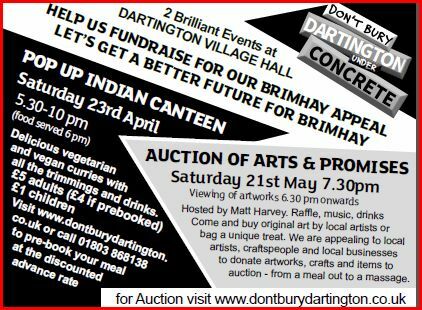 A Pop Up Indian canteen – Friday 23rd April- when Dartington Village Hall will be transformed with tables of vegetarian and vegan curries, rice, popadoms, chutneys – all the trimmings- plus soft drinks and beers from the wonderful New Lion Brewery. The family friendly event, with childrens activities, starts at 6 pm- all at a very affordable price- see below, book your tickets – numbers limited. Auction of Arts and Promises- Saturday 21st May with celebrity poet Matt Harvey as our auctioneer! Come and buy your own piece of art from some of our talented local artists and craftspeople- or bid for activities and experiences. We have already been offered the chance to learn to bake bread with the Almond Thief bakers, sing with Selena Mara, enjoy meals out, massages and an expert declutter session! Whilst artworks from Dartington and Totnes artists Amy Chudley, Bethan Welby, Paula Cloonan and more will feature in the auction, we are calling out to anyone who can donate a piece of art, craft, an experience or a treat to get in touch. As donations come in, we’ll be featuring them here or on the DBDUC facebook group page, so you’ll get a preview of what’s on offer. We also aim to have local music during the evening- so musicians- come and perform to a great local audience and help us have a fantastic evening and raise funds too. Anyone able to help with these events, do get in touch and watch out for more events this spring and summer. A big gig, wildlife walks and table top sale are all in the pipeline. I would like to offer a free Tarot consultation, including a look at the chakras – these normally take between two and three hours which would normally cost £50. I live in Totnes. Best of luck on the evening.